To anyone familiar with the media landscape surrounding Syria, Russia’s presence in the war has always been prevalent. This has been especially true since their military intervention in 2015, and this has had an increasing impact on the media. In many ways, Russian media is more well-connected in Syria than any Western news outlet could ever hope to be. US news crews from ABC and NBC can sometimes score a coveted interview with the Syrian President Bashar al-Assad. More generally, they have mostly been able to report from refugee camps or secure areas on the border. Meanwhile, news outlets allied to the Baathist government operate freely within its territory. RT Arabic was one of the only foreign news organizations stationed with Syrian Army troops during the 2017 Palmyra Offensive. There are countless examples of misinformation about Syria being disseminated. Even so, the focus of this piece will be on two major attempts to reframe events through a Russian-approved lens, and the piece will be divided into two parts. 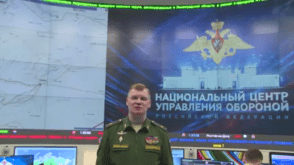 The first highlights Russia’s continued attempts to denominate rebels in Syria as ISIS. 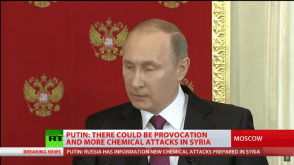 The second analyses the media offensive to change the story on the chemical attack on Khan Shaykhun. Russian Ministry of Defence video on the airstrike on what was claimed to be an ISIS training camp in rural Idlib province on October 12, 2015. 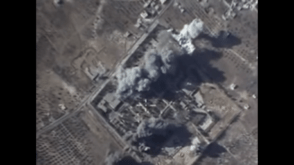 Claims that the targets were secret ISIS cells operating in rebel-held territory may have been plausible, but the RuAF was striking large fortifications and so-called “training camps” for ISIS fighters. The implication of designating these exposed targets as ISIS was clear: Russia was trying to intertwine the fight against ISIS and the Syrian rebels with one another in order to shake up the narrative, despite the reality on the ground of open war with one another. Another round of airstrikes occurred two days later in Idlib and Latakia, the former claiming to be on an ISIS ammunition depot near Idlib City. A week later, more airstrikes hit targets in rebel-held territory designated as belonging to the Nusra Front as well as ISIS positions.7.“Combat report: Russian jets strike 60 terrorist targets in Syria in 55 sorties” : RT After this instance, the Russian Mod stopped claiming to be hitting ISIS positions. There was no mention from either the Mod, nor RT or Sputnik, about ISIS presence in Idlib or Latakia until December. This was when the Latakia Offensive by the Syrian Arab Army (SAA) reached Jabal an-Nuba. RT claimed this mountain was under ISIS control until its capture in December 2015. ISIS had actually retreated from the area almost two years before, leaving its control to the Islamic Front and the FSA. After the capture of Rabia in January of 2016, there was a strange break. 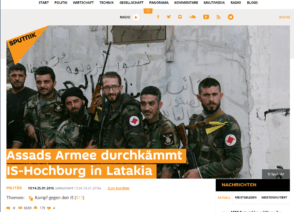 While both the Russian Ministry of Defence and RT had claimed that the Syrian Army had captured Rabia from al-Qa’idah and aligned rebels, Sputnik, specifically Sputnik Deutschland, claimed that the Syrian army had captured Rabia from ISIS. From there on, the Russian government and their media outlets did not reference anything about an ISIS presence in Latakia, until February 19, 2016, their final mention to date. A video on Sputnik’s English-language YouTube Channel claims that the “last stronghold of ISIS” in Latakia had been cleared.9.https://www.youtube.com/watch?v=K0crndaEkFM After this video however, there were no more accusations of ISIS presence in Latakia, from any Russian news outlet or official source. From this lack of coverage, if one had been following Russian media and Russian media alone, one could assume that after Kinsabba was recaptured by the Syrian army ISIS had been ousted from Latakia and Idlib. In a one-off attempt in 2017, Ruptly again claimed ISIS presence where there hadn’t been. In mid-June, while the season’s Dara’a Offensive wound down to an indecisive stalemate, Russian news crews arrived in the province and embedded with the Syrian army.10.“US, Russia ‘agree Syria ceasefire’ amid Trump-Putin G20 deal” : Alaraby On June 12, Ruptly released a video entitled, “Syria: Fighting between SAA and rebels in Daraa intensifies.” Neither the title nor the accompanying description mentioned ISIS or even the Nusra Front, and instead simply referenced the fight against the rebels. Nevertheless, four days later, the same Russian news network changed the story about who the Syrian army was fighting in Dara’a City. A new video of combat released from the province was titled, “SAA resumes offensive on Daraa killing dozens of IS militants.”11.https://www.youtube.com/watch?v=QSBBiwqCpuk The description below the video added onto the new narrative, saying “Syrian Arab Army (SAA) forces resumed an offensive targeting self-proclaimed Islamic State (IS; formerly ISIS/ISIL) fighters in the city of Daraa, Thursday.”12.https://www.youtube.com/watch?v=QSBBiwqCpuk The implication of “self-proclaimed” was that the city was being held in part by the newly declared IS fighters who had appeared near the border with Israel in Quneitra and rural Dara’a province. This was false. ISIS has never had any presence in Dara’a City at any point in the war. The self-proclaimed ISIS fighters in Dara’a had never expanded past the southwest of the province, as they had mostly occupied a series of villages and farms, far from the city itself.13.“US and Arab-backed rebels open new front against ISIL in Southern Syria” : The National The Syrian rebels and ISIS in Dara’a had also been in open conflict with one another, since March of 2016, leaving them little room to expand further. But, there was still a logic behind claiming continued rebel-ISIS cooperation. Russia could pin future incidents on something resulting from that alleged covert cooperation. 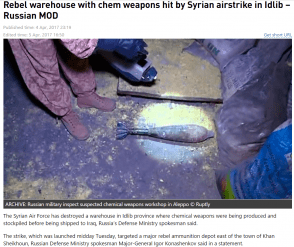 Still from a Russian Ministry of Defence video, claiming that the airstrike on Khan Shaykhun hit a chemical weapons depot preparing shipments to Iraq for ISIS. Images of dead Syrians began to pour in from local activists, with White Helmets actively working to help the survivors. 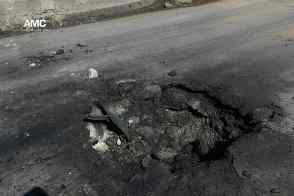 Bodies remained intact, as the gas primarily affected internal organs and the skin.17.“Worst Chemical Attack in Years in Syria; U.S. Blames Assad” : The New York Times It was at this point that two narratives about the incident, divergent in nature, began to emerge. One of the craters from the dropped munitions in Khan Shaykhun. Damage from the shell itself is minimal, with relatively little cratering and debris seen. While this is no longer the official single narrative of the Russian Ministry of Defence, the original report about the airstrike on the depot occurring at midday remains up on RT. The Russian Ministry of Defence then issued a statement saying that they had hit a chemical weapons depot in Khan Shaykhun at around midday (11:30 a.m.-12:30 p.m.), spurring a catastrophic explosion that resulted in the release of harmful chemicals.19.“Rebel warehouse with chem weapons hit by airstrike in Idlib” : RT The chemical weapons within the depot were reportedly meant to be shipped to Iraq for use by ISIS. However, this narrative was problematic: reporters on the ground had already found the impact site, and it had occurred before 11:30 a.m. It certainly wasn’t on anything that could be considered a depot. Still from an RT report on a news conference given by Vladimir Putin on April 11, where the Khan Shaykhun false-flag narrative was officially endorsed by the Russian President himself. This was the first instance from Russian-owned media where the false-flag story was stated without any ambiguity. With a member of the Syrian government now standing behind this narrative, the Russian media began running wild with it. We don’t know whether those dead children were killed in Khan Shaykhun. Were they dead at all? While this new narrative sparked an uproar among the international community, it also sparked a new fury in how news outlets aligned with the Syrian government approached the story. Bolstered in credibility by a report by famed investigative journalist Theodore Postol, the piece was later found to be riddled with errors in chronology and retracted,22.The French Intelligence Report of April 26, 2017 Contradicts the Allegations in the White House Intelligence Report of April 11, 2017 Sputnik News became the main driver of stories in support of the new narrative of complete fabrication. RT, while still continuing to push out news reports disputing the official narrative of the chemical attack and the credibility of the White Helmets, refrained from any outright chemical attack denials. While Russia and its allies in the Resistance Axis are by far the most seen and well-known pushers of misinformation about the Syrian conflict, they are by no means the only. Turkey, through its many state-sponsored media outlets, government ministries, and allied newspapers, are also mass pushers of propaganda and disinformation. This is a campaign that ramped into overdrive when the Turkish state invaded Afrin Canton, a campaign we will cover in the next piece of this series.